First up, this is the way the league is being run. I don't care if you prefer other sites fantasy platforms, or prefer snake draft, or prefer different scoring. If you don't like the setup of this league, don't join, as no changes will be made. This is an INVITE ONLY league, as I am trying to avoid what's happened in the past with people losing interest halfway through the season, not paying, and disappearing. If you have not received a PM inviting you to this league, then you may only express interest to join a reserve list. If you have signed up but have not paid by the Aug 25 due date, you will be replaced from anyone on the reserve list. The league will 12 players. The Draft will be run online at 8pm AEST, Sunday Aug 31. It will use the ESPN Online Draft Lobby platform. It is an Auction Draft. If you are unfamiliar with either the ESPN Draft platform, or the concept of an Auction Draft itself, then you can familiarise yourself at anytime by going to the ESPN Mock Draft Lobby available http://games.espn.go.com/ffl/mockdraftlobby and signup to do a Mock Auction Draft. I promise you, both the ESPN Draft Lobby, and the Auction Draft format itself, are perfectly suitable for our league. 4. dsd - arranged to pay and back in! Can I get an invite? this is now OPEN to all who wish to join. We now have 10 entrants. Woo. 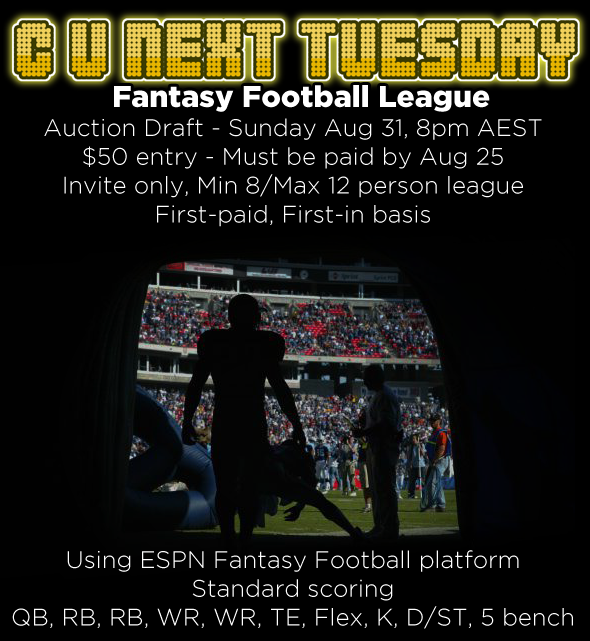 Two more spots open, as this is a MAXIMUM 12 man league. Also, please note that we will be DRAFTING on ESPN but running the league itself on NFL.com's fantasy platform. This is based on some testing and feedback received. We now have a full roster of 12 people. However, it's possible someone may pull out. If you're still interested in playing, let me know and i'll add people to the reserve list. PM's sent out with payment details people. Get that money in! Bump! DSD is back in with luko pulling out.